Posted by Victoria Bond to the School Guide Blog on 16 October 2015. The Department for Education has this week published early league tables for state secondary schools in England, based on provisional data from this summer's GCSE results. The aim is to give parents a taster of 2015 GSCE data to help those families frantically completing application forms for English secondary school places due in by October 31st. 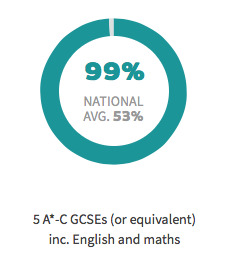 The new tables show the percentage of pupils achieving five or more GCSEs at grades A* to C, including English and maths, as well as the number achieving the English Baccalaureate (GCSEs at grades A* to C, including maths, English, two science qualifications, a foreign language and either history or geography). Schools Minister Nick Gibb has said that these early tables will provide help parents make a more informed choice. Parents should read the new tables with caution, however, as they are only based on provisional results and the appeals process could see as many as 54,000 GSCE grades changed before the official school performance tables for English secondary schools are released in January 2016. Head teachers have also warned that these “partial tables” may give parents an “inaccurate and incomplete picture” about a school’s performance in the last academic year, according to this BBC report. In response to feedback from parents and schools, School Guide will update our GSCE data when the full performance tables are released in January but parents can view the early results by following the link above.